An Indian wedding is a grand affair involving months of preparation and planning ahead of the wedding day. Each and every aspect of it, right from beginning to end, requires immense attention and care. One such important aspect is deciding the Wedding Invitation Card and its content. Indian communities give a lot of time and emphasis to their wedding invitation cards as it is not just the beginning of an auspicious occasion but also bears a religious significance. But the job of selection of a wedding card is not as easy as it seems since the Indian Wedding Invitation Cards are quite elaborate. Usually people here go for the rich, beautiful and pompous ones as they are supposed to reflect the host’s personality and affluence. There is a lot of excitement regarding its designing and plenty of suggestions come in before a final draft is made. Also the vast cultural diversity in India leads to a broad variety of wedding cards available in the market. A Hindu wedding invitation card would be totally different from a Christian, Muslim, Sikh or Parsi wedding card. Here are a few tips which will help you to choose and decide the most appropriate card for your wedding. Budget: The first important thing in this process is to decide the budget for the wedding card as the cards come in a very wide range of costs. Design: Most of the Indian wedding cards are traditional with religious motifs, quotes and designs, but these days there are plenty of modern designs available too. It’s up to you to decide whether you want the card design to be traditional, religious or modern. Color: Indian wedding cards usually have very vibrant and bright colors highlighting the mood of the celebration. The dominating colors in the cards are red, saffron, green, yellow with a touch of golden all over, symbolizing energy and love. The modern ones have subtle tones of pastel colors. The color and design of the envelope should match that of the invitation card inside it. Decorations: Plenty of lovely embellishments like mirrors, golden threads, colored stones and gemstones can be used to make the card look rich and resplendent. The modern ones make use of ribbons, crystals etc. Size, Print and Font: One can decide on the size and print of the card depending on the number of functions to be held before and after the wedding. It’s important to choose an appropriate font for the content, keeping in mind the color and the design of the card and the theme of the wedding. Material: The quality of the paper used in making the card makes all the difference in the final appearance of the card. A high quality material will make the card look more impressive. There’s a huge variety in quality of papers available in the market these days, including some handmade variants. Perfumed cards are also a favorite these days. Courier Friendly: Ensure that the card is courier friendly so that you can send it to relatives and friends conveniently when you can’t deliver it personally. One essential aspect to be kept in mind while deciding the content for the wedding card is that, it should represent the religious and cultural traditions of your family. All the events before and during the wedding should be clearly listed with the date and time for the convenience of the guests. The content should be crisp, clear and concise for better understanding of everybody. Spelling errors should be strictly avoided. The RSVP contacts should be clearly mentioned on the card. 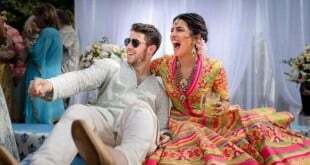 These days the high profile weddings include a swipe card along with the invitation card for the guests’ entry for security reasons. All the details of the guests are loaded on the card and are verified when the guest swipes it. Traditional Wedding Cards– Beautiful traditional card varieties are available with reusable boxes and accompaniments such as chocolates, dry fruits, sweets, quaint gifts etc., to be given along with the card. You can pick or customize a card as per your budget. Offset Printed Wedding Cards- They can be made in a variety of colors and stationary, are cost friendly and yet look pretty rich. So if you have a limited budget, offset printed cards could be a good choice. Scrolls- They give a royal and rich feel to your wedding invitation. They look unique and never go out of fashion. They usually come with the printed fabric material enclosed in a box and are generally more expensive than the normal cards. Theme Based Cards- If you are having a theme based wedding such as a fairy tale theme, fun theme, royal theme etc…. or in a particular location, such as a beach, garden, resort, fort, palace, another country, etc., you can incorporate those ideas into your card and give an exclusive and exotic look to it. 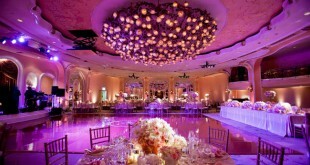 It will surely arouse the imagination of your guests and they will look forward to your party with a lot of enthusiasm. Engraved wedding Invitations– Engraved wedding cards have embossed letters and images on them that are slightly raised while they are indented on the backside of the paper and give a 3D effect to the card. 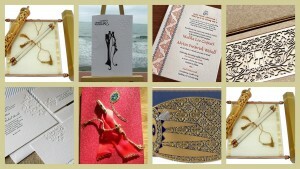 Contemporary Wedding Cards– They come in a variety of shapes and materials such as fabrics, metals, jewels, glass etc. and look rich and unusual. Creative Handmade Wedding Cards– They are suited for a smaller and limited number of guests as they have to be hand crafted and hand written which is a time consuming and expensive affair, but, they give a personal touch to the card. Customized Wedding Cards– Get over the boring stuff and get hold of a card designer who can make a spectacular customized card for your wedding with the photograph of the bride and groom on it. Everybody will go gaga over it! You can think of other such exciting ideas to make your card special. 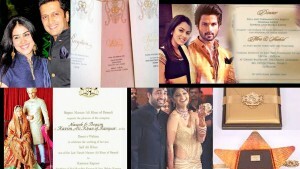 Celebrity Wedding Cards- You may also feel like seeking inspiration from the invitation cards used by Bollywood or sports celebs in recent past. Harbhajan Singh or Shahid Kapoor’s Wedding Invitation Cards would be worth going through in such a case. This must be remembered that your wedding invitation card stands out for being a reflection of your personality and the type of event you are hosting. It should help your guests visualize the moments that are to follow and also last in their minds for days after the event gets over. With so many options available, it won’t be difficult to do that!